Congratulations, America. We’re biking to work more than ever before. We’ve known for a while that Americans are driving less than they used to, even as the economy grows. And just about every quarter, the American Public Transportation Association delivers more stats about increasing transit ridership. Now the Census brings another measure of Americans’ shifting transportation habits: Bicycle commuting grew 9 percent last year, bringing it to a historic high. What’s more, the ACS data shows that the growth in bike commuting by women is outpacing that of men. Between 2011 and 2012, the growth in bike commuting by women was 10.9 percent, compared to 8.4 percent for men. The growth in bicycling isn’t happening in a vacuum. Safe infrastructure for bicycling is becoming a priority in cities across the country. Cities like New York, Chicago, and Washington, DC, are competing to add the most bike lanes. Smaller cities like Indianapolis and Memphis are also building bike routes at an impressive rate. Last year alone, the number of protected bike lanes in the United States rose from 62 to 102. Meanwhile, the rapid growth of bike-share is reducing barriers to cycling in several cities. Any wagers on how much bike commuting will increase in next year’s Census? 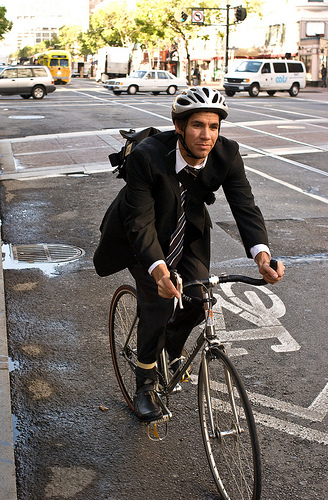 While bike commuting is on the rise, the simple walk to work is losing ground. Almost four million people walked to work last year — 2.8 percent of all commuters. That’s a 28 percent drop in mode share since 1990, when nearly 4.5 million people commuted on foot. The percentage of people walking continues to drop — about 1.5 percent even since 2009. Nearly half the people who walk to work report that the trip takes less than 10 minutes. A hardy 163,000 people walk more than 35 minutes to get to work. Transit commuting has yet to climb back to 1990 levels, when 5.12 percent of workers rode public transportation. After years in the 4 percent range, transit mode share cracked 5 percent in 2008 and has teetered around that number ever since — a little bit up one year, a little bit down the next. Battered by the economic downturn, many transit agencies have had to cut service or raise fares at a time when more people are looking to save on transportation costs. Solo driving still accounts for a monstrous 76 percent share of the commuting public. And while the percentage of people driving alone is down ever so slightly from the past two years, it’s been on a long-term climb, up 4 percent since 1990. Those rising numbers have taken the biggest bite out of carpooling, which has gone from a 13.4 percent mode share in 1990 to a 9.7 percent share last year. But a closer look reveals that young people are leaning in a different direction. Tony Dutzik of the Frontier Group, which has co-written with U.S. PIRG the groundbreaking reports on changing transportation preferences, notes that the share of 20- to 24-year-old workers who car-commute has declined by 2.2 percent over the last six years. Here in NYC, the incline in bicycle commuting has become very noticeable. It’s become increasingly desirable due to our heavy traffic and strained mass transit system; combined with our walkable, mixed-use neighborhoods. I would assume that most of this growth has occurred in urban areas. easier to find a contemporary bike commuter photo! I have no idea how Hudson TMA acquired it. The increase in bicycle commuting is exciting news. Though absolute numbers are still tiny, we should take heart at an annual growth rate of 9%. At that rate of change we will double our mode share every eight years. Seems like we should keep pushing for bike infrastructure, since that seems like what’s pushing these changes. One more critical caveat. If your commute combines different modes, the ACS counts according to which covers the most mileage. So I’m considered a transit commuter even though I ride the train for 15 minutes and bike for 30 minutes. I don’t begrudge being counted as transit per se, but I wish they would recognize the bike as an integral factor in my commute. If I couldn’t ride to and from the train, I would probably be driving, not taking transit. I haven’t noticed an incline while bicycle commuting in Chicago. It’s pretty flat here. Lol, didn’t catch that. Guess I need to “speed up”. As one passionate about cycling, I lied on my last census. 50 minutes cycling to a 60 minute train to work. What did I cite as my primary means of commuting? The bike. Is that wrong? I don’t know, it felt right at the time. Portland has been 5.8-6.3% for five years in a row. The other top five performing large cities all seem to be gaining on Portland. The three largest cities are at the beginning of making consistent gains. Chicago and New York City show a two tenths of 1% increase year over year. This puts NYC bicycle commuting modal share at 1%, the same as Los Angeles. Age group is what matters. I started commuting by bicycle relatively late in life, but I am an exception. Most people become set in their ways, as I am in other ways. I don’t think those who travel by bicycle are going to stop. Thinking back, I wish I had done it all along. I’m not sure how true that is. I used to never go anywhere by car, but now that I have multiple children I often use a car. People change in both directions.